Job, Yet Gentle On Your Feet. Welcome to Richards Footwear and Thanks for stopping by and letting us serve you. 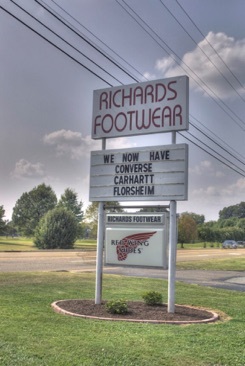 Richards Footwear is a family owned and operated business that has been serving the West Tennessee area for 25 years. We sell quality work footwear for men and women including: Regular Plain-Toe Footwear and Safety Toe (Steel, Composite, Aluminum, & Titanium) Footwear ranging from Casual Dress to Tennis Shoes and Hiking Boots, 6" and 8" Lace Up Boots to Pull-On Western Boots, Metatarsal Guard, Waterproof, Insulated, and Hunting Boots --- Featuring Famous Brand Names such as Carolina Shoes, Caterpillar (CAT), Double-H Boots, Florsheim, Georgia Boot, Irish Setter, Irish Setter Work, Red Wing, Reebok, Rockport Works, Rocky Boots, Thorogood by Weinbrenner, Wolverine, WORX and many others. At Richards Footwear we ONLY sell footwear. We want to do one thing and we want to do it right. We do not want to be distracted by anything else. We will measure your feet and then discuss any foot, leg, or back problems you may be having. If you have diabetes, plantar fasciitis, problems with circulation, heel or bone spurs, nerve damage, or foot numbness... we have the accessories and footwear to help remedy and relieve your pain. We will work with you and your Podiatrist or Orthopedist to get you what you need. If we can not help or do not have what you are looking for, we will tell you where you can get it or try and help you find it. Why? Because we want you to know we care, whether you buy anything or not. Thank you for your interest in our company. If your employees have any shoe needs, We would be happy to assist them in determining what they are. Over the years working with my father I have noticed and learned that the primary problem employees have with shoe dissatisfaction is comfort. We believe this does not only come from inexpensive or poor quality shoes but is also largely due to improper shoe size, width, or fit. We try to take the time to educate our customers on shoe fit, and get them into a proper shoe that will make them happy in order to keep them coming back. We know that this in turn makes them more productive at their workplace. We would welcome the opportunity to serve your company. We can also accommodate your employees through payroll deduction forms, vouchers, or any other means that your company request. We honor National Account Programs and pricing and have pricing plans for local businesses that are equivalent to those National Accounts. After-Hours Appointments are available upon request.